I finally read a book this week over the course of a few days that I've had my eye on for a couple years. The cover and title had enough appeal for me to buy it. It's not a new book, but the message will never grow outdated. 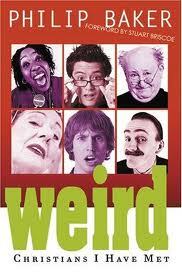 Weird Christians I Have Met by Philip Baker is a book about ten types of weird Christians and a plea for balance in the Christian life. I like to say that everybody's weird in their own way. It makes me feel better. I can't say I would have used the word "weird" in the title of this book. Most of the people Baker talks about just overemphasize one area of the Christian life and disregard another. The author gives each of his characters a self-explanatory name and face. There's End-Time Ed, Pentecostal Pamela, Theological Theo, Demonic Dave, Frank Faith, Backslidden Bob, Gullible Garfield, Judgmental Jill, Prosperity Patricia, and Plastic Pete. For the not so straight-forward ones, Demonic Dave always thinks the devil made him do it, Frank Faith thinks we just need to have more faith, Gullible Garfield believes every new teaching he hears, and Plastic Pete has to put on a show so everyone thinks his life is good. Now, most of these characters have some positive qualities, but the negative definitely outweigh them. Of course, picking up a book like this made me go "Who am I?" I was feeling pretty good when I got close to the end and hadn't seen much of myself in any of them. I do have some Judgmental Jill in me, although I'm really working on that. I thought maybe I'd be the perfectly balanced Christian. I wish. I got slapped when it came to Plastic Pete. I don't like to think of myself as inauthentic, but I can be pretty good at making it look like my life is all good when it's not. I really appreciated a lot of what the author had to say about Pete, but some of it kind of hurt. A lot of it was true of my life. You see, Plastic Pete has a really hard time letting people know he has problems in his life and confessing sin. He can probably identify with the Let's Not Talk About That post I wrote awhile ago. And part of it, as Philip Baker points out, is the church's fault. "One of the compounding problems that Pete faces is that many churches encourage his behavior. Peer pressure or theological persuasion create an atmosphere that is hostile to honesty. Judgment and disapproval fall quickly on those who admit to struggle, and rather than risk social or religious excommunication, Pete stays quiet." "Plastic Petes pretend everything is okay when it's not. They perceive that to admit fault, confess sin, and share problems will only bring intense shame, both from God and from other Christians." Yep, that's pretty much the way I think. That's why if you ask me how I'm doing, and I say I'm okay, I'm usually really not. I just don't want to talk to you about it. It's hard to believe that the truth sets people free. It's a tough kind of person to be, not just for others, but for yourself as well. Lately, I've started getting tired of playing the game, and I'll slowly begin to open up to people and be real. As much as Christians hate fakers, I think sometimes they fear authenticity. Sometimes, when Christians start being "real", I get scared and annoyed. But now I'm starting to sympathize more with them because I have major problems too. Overall, I really appreciated this book. It was a light, easy read and made the point quickly. It identified areas where Christians need more balance, and I think we'd all be a happier bunch if we found it quickly. I think most people have their share of plastic in them. I'm not the person to wear my feelings on my shirt sleeves, I only share a little with those I trust the most. I think in a way that it's fair to be that way. But there is a difference between not wearing our feelings publicly and pretending to be something we're not. If we're pretending to be holy, and yet our hearts are far from it, who are we fooling? The only one that cares is God, and if we're doing it please people we're not doing any good. Other than maybe keeping the people happy. I think most of us are afraid of the horrified looks and lectures we'll get, because a lot of people then tend to be Judgemental Jills. What a hard world we live in.